Xavier Johnson and Josh Scott: two top 100 players without a doubt, both are able to make a good impact for Colorado, a program headed in the right direction.I expect both to get starting five minutes before the end of the season, Johnson has a well-rounded game and a nice stroke that will serve him when coupled with Andre Roberson, while Scott has made great improvements in the last year and is at least a good Pac 12 caliber frontcourt player. Tad Boyle this year will have more expectations for this bunch, especially after the great final of last season. 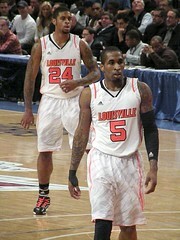 Aaron Thomas and Montay Brandon: behind Snaer and Miller the Seminoles doesn’t return proven backcourt players. Brandon and Thomas will have good minutes cause they seem tailor-made for the style of Hamilton. Both have good size and athleticism, Thomas is the better shooter, while Brandon is more versatile and take pride from defending multiple positions. I expect Brandon to play a little more this season thanks to its defense, while Thomas will have a full year to learn from Snaer before getting his starting job next year.In the long run they have several area of their game to improve, but with the hard work that Hamilton will ask them, both could have a nice career and make a living thanks to this game. Nik Stauskas: he isn’t highly touted as the other members of the class headed to Michigan, but Stauskas will be part of the rotation from this season, having solid size for the wing positions and a skill set that fit in with the style of coach Beilein. With the departure of Douglass and Novak there will be many minutes for Nik, that will show his unlimited range on his shot while providing good defense and a better than advertised all around game. Ricardo Gathers: coach Drew has a good one in Gathers, a former St.John commit. He is ready to play in the starting five from every standpoint. He is a monster on the glass and play both facing than with his back to the basket. He is the most ready to play between Baylor’s freshman and there will be a point when Drew will have to pick him ahead of Austin to share the frontcourt with Cory Jefferson(my choice for breakout player at Baylor). D’Vauntes Smith-Rivera: this Indiana product is a do it all comboguard with good size and a skills set really impressive. Coach Thompson has a good record for find these type of players (Clark,Freeman) and Smith-Rivera could have a similar impact, maybe starting from day one. He is ever in control, never hunting shots, and fit very well in this system. If he will be able to improve his body especially from an athletic standpoint, Smith-Rivera should draw many NBA scouts to scout his talents.